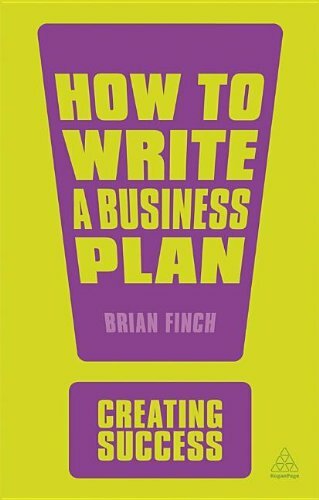 Starting with the premise that there's only one chance to make a good impression,How to Write a Business Plancovers all the issues involved in producing a business plan – from profiling competitors and forecasting market development, to the importance of providing clear and concise financial information. It also includes a full glossary, case histories and a detailed section on the related issue of how a company can best use internal business plans. New in this edition are summaries at the end of each chapter, updated advice on producing cash and forecasts and a more detailed questionnaire to help with forecasting. Brian Finch has been Director of Business Development for large UK public companies, as well as co-founder and Finance Director of an SME retail business with substantial internet trading. By background an engineer and certified accountant, he has an MBA from the London Business School. He is the author of a number of self-development books, many translated around the world, including The Times Guide to How To Write a Business Plan 3 rd Edition, (Kogan Page). Do you include a forecast?